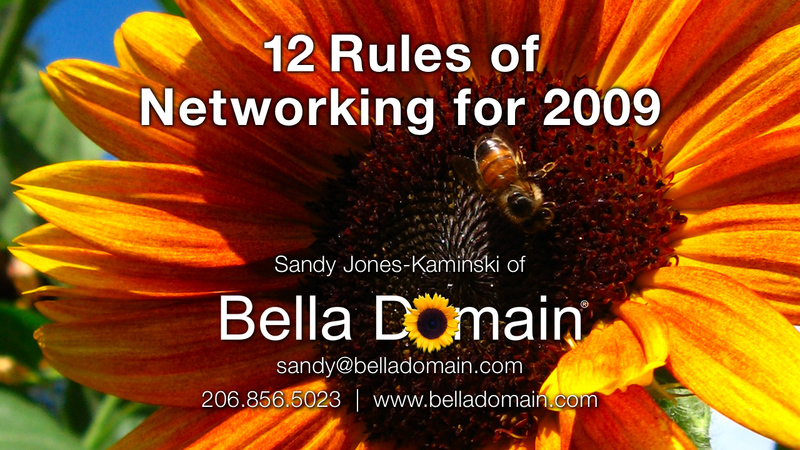 In this next meeting, we’ll be joined by a good friend of Career Horizons and one of the top local experts on professional networking, Sandy Jones-Kaminski of Bella Domain. Having recently published her new book, mentioned above, Sandy has agreed to come share some of her top tips about how to win friends and influence people in the modern marketplace. A huge proponent of the “pay it forward” philosophy, she’ll be discussing some personal stories of how she’s leveraged her network of relationships to great effect and how her constant attempts to assist others have brought her many levels of personal/professional prosperity, in return. It should be an exciting discussion, and in the first hour of the meeting, we’ll also be engaging in some networking exercises and icebreakers designed to help all of you make some new acquaintances and become more effective at this important interpersonal aspect of the job search process. What a great time I had and what a wonderful group this was to be part of today! Thanks so much Matt – you’d be hard-pressed to find a bigger fan than moi! Myth #1: Networking means you’re looking to use people to achieve selfish goals, or opportunistically ask people for help. nétwerk n. & v. a group of people who exchange information, contacts, and experience for professional or social purposes. Networking can be defined as one’s efforts to create this group, and of course it can be done honestly and considerately! Myth #2: You have to be a born networker or a natural at it. REALITY: The skills needed to be an effective networker can be learned by anyone. Get comfortable asking folks you meet, “So, what are you working on these days?” or, “What do you need help with right now?” Then, just read my new book titled, “I’m at a Networking Event—Now What?? ?” for more ways to further develop your networking muscle. Myth #3: You must have above average charisma to be a good networker. REALITY: You merely need to be thoughtful, sincere and genuinely helpful. You get offered a job or opportunities from people who are trusting of you. There IS a hidden job market out there, but you have to be willing to be open and giving to be part of it. Myth #4: You have to be a good talker or an overly chatty “schmoozer” to be a good networker. How often do you find yourself on the receiving end of someone try to convince you that you could leverage the useless thing/service/contact or whatever they’re trying to “offer” you? If I had a dollar for every time this happens to me, my 401(k) would undoubtedly be back where it used to be. I simply do not understand why people just don’t ask you what it is you need help with…..? Do they think that maybe you don’t actually know? Do they really think they know more than you do about what it is you really need? Are they afraid that they won’t be able to help you with what it is you really need and then can’t possibly ask you for what it is they need help with (and perhaps the real reason for the coffee invite)? This is yet another topic I touch on in my “12 Rules of Networking for 2009 white paper.” Networking Rule #3 Offer Help to Others First speaks to the idea that once you get past the initial pleasantries when you’re at a networking event or meeting someone for coffee, ask the other person what it is they need help with these days. It’s really that simple, just ask. DON’T assume ahead of time that you know what they’re challenged by right now, and then find yourself obviously and awkwardly trying to offer something that is completely off base, or even worse, pretty clearly self-serving. And what happens if you can’t immediately offer help to them in the area in which they need it? Nothing. You just assure them that you will keep it top of mind and maybe even thank them for letting you know exactly how you can help them. Try it. I think you’ll be surprised how soon you might come across the thing they need, or maybe then be asked what it is you need help with, or maybe you won’t, it doesn’t matter. You were just given a golden opportunity to pay it forward down the road. Be grateful and have a little more faith in the universe.